Reid's Limited Senate Options Lead To 'Nuclear' Threat : It's All Politics Sen. Harry Reid's current reality seems to give him few choices other than threatening to change the Senate's rules to restrict the use of filibusters. Senate Majority Leader Harry Reid warns that if Republicans don't relent on filibusters, they will leave him no choice but to change the chamber's rules. Sen. Harry Reid may sound a tad hypocritical to some for saying he now supports changing Senate rules in order to end the one that says 60 senators must approve before presidential nominations can get up or down votes. This comes only several years after he indicated he opposed changing the requirement to a simple 51-vote majority. But a Washington politician who can't offer up a technically plausible explanation for what seems like a 180-degree change in position wouldn't be a very good one, and to become majority leader, by definition, requires one to be a fairly deft politician. Thus, when ABC News' Jeff Zeleny on Monday asked Reid the "hypocrite" question after the Senate majority leader's speech at the liberal Center for American Progress, the Nevada Democrat was ready. Back then, when he was opposed to ending the minority party's right to filibuster, he was talking about nominees to the judicial, not executive, branch. REID: "No, what it is, is you don't understand the right question. ... I wasn't talking about changing the rules for [executive branch] nominees. I was talking about changing the rules for judges, OK? It's a new era. I mean ... approximately 420 times we've been filibustered. ... So it's a totally different world we live in, and I don't — I — of course, I wasn't the leader at that time, but anyway, that's what I said. Here's how I feel now. Different situation." That's the kind of nuance likely to be lost on or ignored by Reid's Republican opponents, some Democratic senators, many voters and many of the news media. And it does seem to run counter to Reid's remarks during a 2008 C-SPAN interview with Tom Daschle, who also once led Senate Democrats, in which Reid appeared to speak unequivocally in support of the filibuster. At least, he seemed unequivocal at the time. Senate Republicans offer a version of reality that's obviously different. Senate Minority Leader Mitch McConnell of Kentucky said on Meet the Press Sunday that of President Obama's 1,540 nominations, only four were "defeated." MCCONNELL: "He's not lost a single member of the Cabinet. He's getting them faster than President Bush was at the same time in his second term. The majority leader needs to bring these nominees up. Most of them are going to be confirmed. It really kind of comes down to three appointments that the federal courts have told us were unconstitutionally 'recess appointed.' "
For one, some of his Senate Democratic colleagues have been agitating since the start of the year to change the filibuster rules. A bipartisan agreement momentarily defused that earlier crisis. But Republican refusal since then to allow votes on seven Obama executive branch nominees, including his picks for the Consumer Finance Protection Bureau, the Labor Department and the Environmental Protection Agency, has rekindled the desire of many Senate Democrats for a partial defilibusterization of the Senate. So by threatening to push through a rules change by a simple majority vote, Reid keeps his own troops encouraged. "Simple solution. I mentioned it in my remarks. So easy. If the sky is falling and they think it's falling, let them stop the filibusters on the seven that I filed cloture on, and we will have up-or-down votes on these people and go on to the business for the day. That seems pretty simple to me." Of course, Reid's nightmare would be failing to get the 51 votes required to make the Senate rules changed if a vote is actually held. As of this writing, there's the possibility of a Tuesday vote. Such a failure would be a real blow to Reid, signaling weakness since it would mean the loss of several votes in the Democratic caucus. It would make his already difficult job even more so. But Reid must be fairly sure he can get to at least 50 votes before counting Vice President Biden's vote to reach 51. In any event, in an attempt to have Senate Democrats and Republicans reason together and find common ground, an exasperated Reid scheduled a bipartisan Monday evening closed-door meeting of senators in the resplendent confines of the Old Senate Chamber. That, of course, was also the setting for one of the bloodiest partisan clashes in U.S. history, when in 1856 noted abolitionist Sen. Charles Sumner of Massachusetts was severely caned by Rep. Preston Brooks of South Carolina. Obviously, that wasn't the kind of history Reid was trying to repeat. Instead, he had in mind a similar meeting he called to get both sides together so the lawmakers could hear Sen. John McCain recount his Vietnam prisoner-of-war experiences. 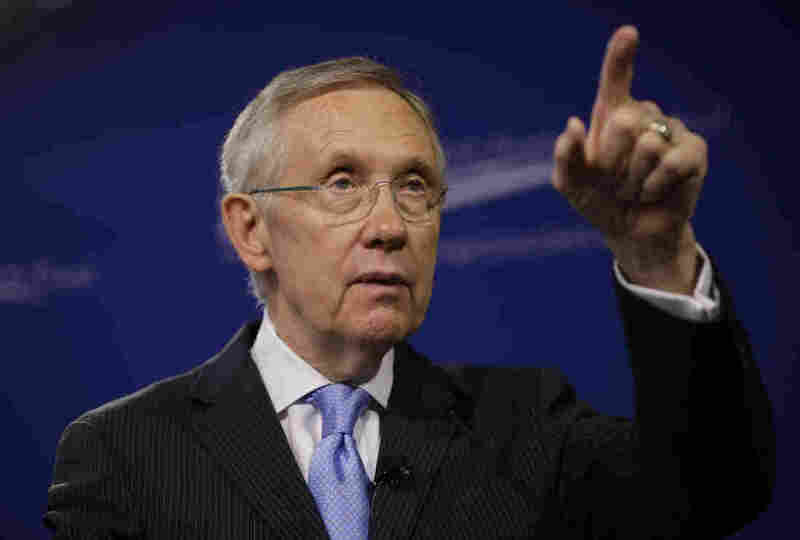 "Hope that sets a tone for the future," Reid said Monday after his speech. If it doesn't and Reid indeed goes "nuclear" by reducing the Senate minority's ability to filibuster, rest assured, that will set a tone for the future. In a phone interview with C-SPAN Monday evening, Trent Lott, a former Republican Senate majority leader, reminded all that Republicans will one day resume control of the Senate and maybe even of the White House and that Democrats then might wax nostalgic for the current filibuster rules.